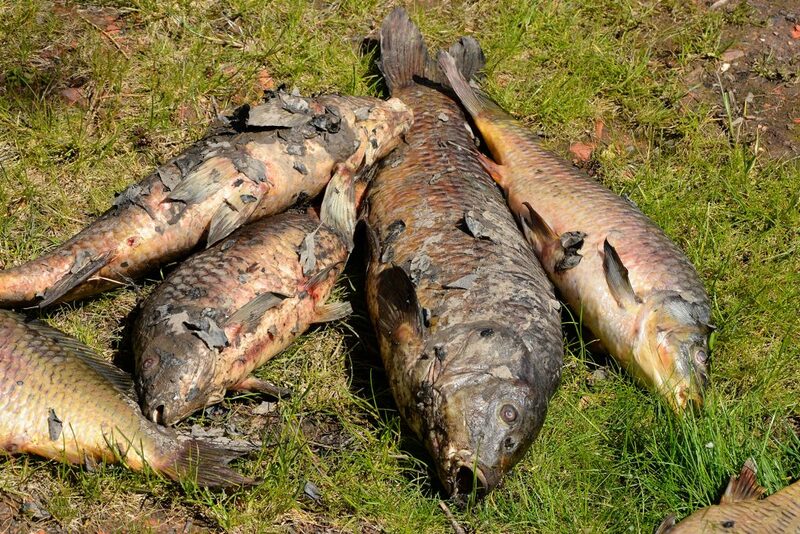 Ireland’s premier public carp water, the famous Lough in Cork City, was recently (May 2018) hit by an outbreak of Carp Edema Virus (CEV) causing mass mortalities with almost 900 carp confirmed dead. A similar outbreak has also caused almost 300 carp to die at a nearby private carp fishery, Belvelly Lake near Cobh. These figures constitute essentially the entire stock of both lakes and the loss to Irish carp scene and coarse angling in general is huge. 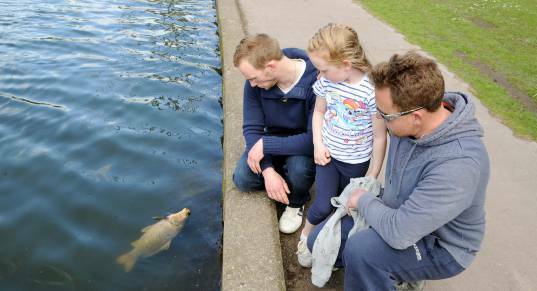 On the weekend of 28-29th April, several carp (4-5) were observed by local anglers to be acting unusual in the Lough. The fish appeared to have some form of infection resembling low level fungal growths. Fungal or bacterial infections whilst not common do occasionally occur in carp populations, especially in the spring period. However, within a matter of 24 hours some 150-200 (estimated) carp were seen to be acting lethargic, with some up near the surface and most grouping up in the margins of the urban public amenity. Initially, local anglers presumed this behaviour and evident stress to be related to a water quality issue, as has happened several times in recent years at the lake. In the following few days more and more fish began to act extremely lethargic despite strong winds, favourable weather conditions and reasonably good oxygen levels. 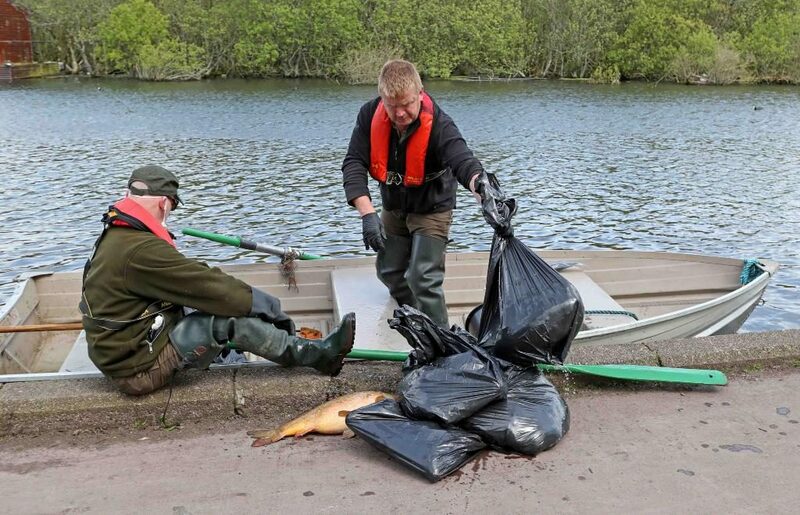 On Thursday 3rd May many hundreds of carp were visibly covered in white patches resembling fungal infections and lethargy was so extreme that fish could be easily netted or lifted by hand out of the lake margins. Initially, some local anglers feared the infection to be “white spot” (a parasitic infection, aka Ichthyophthirius multifilius). Inland Fisheries Ireland (Macroom) were notified of the situation immediately and staff were on the scene within two hours. Urgent calls were made by members of the Cork Carp Anglers Club from the lake on Thursday afternoon to the Fish Health Unit of the Marine Institute (MI), the national reference laboratory for finfish diseases and the competent authority for fish health regulations in Ireland. Emergency health tests were fast-tracked and early the next morning five moribund (clearly dying) carp ranging from 10-12lb were captured by IFI staff and Cork Carp Anglers club members and sent alive to the MI in Galway for testing. All angling and water-based activities were suspended indefinitely on the Lough with many other commercial and club carp waters across the country (including Northern Ireland) quickly following suit, closing on a precautionary basis. On the evening of Thursday 3rd May the first casualties were recorded, with two carp c. 10lb dying. The next day, ten carp were removed dead, including one fish which had clearly been dead for several days. Saturday 5th saw a further 55 dead carp removed by IFI staff. By the 10th May this figure had reached 450 carp and at the time of going to press (May 26th) the official number removed by IFI staff exceeds 850. In Belvelly Lake, similar symptoms (lethargic fish near the surface, unresponsive in the margins, covered in excess mucus and white fungal-like growths) were noticed on the 3rd May and the first few casualties occurred on Friday 4th. Live carp were sent for disease testing on the 8th May. Although the rate of infection/mortality observed was certainly lower than that of the Lough, at the time of publication some 270 carp have been removed dead from the fishery. Again, as with the Lough, this essentially equates to the entire stock of carp in the lake. No other fish species in the Lough (rudd, perch, gudgeon, eels) or Belvelly (tench, perch, eels, sticklebacks) died during the outbreak. Marine Institute fish health experts confirmed that all samples were negative for Koi Herpes Virus before obtaining a positive result for Carp Edema Virus (CEV) in all samples on Thursday 10th. CEV is a poxvirus, originating in the koi carp industry which has begun to spread to wild carp populations in recent years. The virus suppresses the immune system of the fish and encourages secondary bacterial, fungal and or parasitic infections. Indeed, the carp in both the Cork outbreaks were found to have excessive ectoparasite loads (Trichonid species) as well as fungal infections. CEV also causes severe damage to gill cells & filaments and infected fish invariably die of suffocation (anoxia). DNA sequencing recently confirmed the virus to be CEV genotype 1, the so-called “carp strain” as opposed to genotype 2 which primarily affects ornamental koi carp. However, the origin of the outbreaks is unclear and likely to remain so. It appears most likely that anglers inadvertently transferred the virus (most probably on fishing/landing equipment) between the Lough and Belvelly, or vice versa. Which lake became contaminated first is uncertain. The loss of the significant angling amenities of both the Lough and Belvelly is a huge blow to the Irish carp scene and coarse angling in general. The Lough has contained carp since 1954 and has been the country’s most important carp fishery for over 50 years. Local revenue, especially surrounding the Lough, is likely to suffer significantly. Despite being very popular competition venues, the Inniscarra and Carrigadrohid reservoirs in Cork (which also contain stocks of carp) remain closed on a precautionary basis. Sean Long, Director IFI Macroom stated, “While we have not found any indication of this problem elsewhere, given the continued deaths of carp at the Lough and Belvelly, the suspension of angling will continue at Inniscarra and Carrigadrohid for at least the next 2 weeks i.e. until 31 May and monitoring of other [Cork] waters will continue”. On where to go from here and looking to the future Mr. Brazier added, “The angling amenity value of both lakes is now completely gone. It is difficult to move on from such a catastrophe but we must now look towards rebuilding and ultimately restocking. First though, appropriate quarantine measures will need to be implemented on both lakes, with no angling. Other fish species will need to be disease-tested to see if they can act as carriers for Carp Edema Virus, as this element of the disease is as yet unknown. In respect of the Lough, there is a lot of major rehabilitation work to do before the lake is worth restocking, such as de-silting efforts and addressing the very poor water quality. Only then can we begin to think about restocking. We look forward to working with Inland Fisheries Ireland, Cork City Council and the Marine Institute on this”.